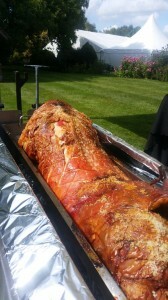 Our hog roast Cornwall team cater in all areas of Cornwall providing fantastic hog roasts for any type of celebration. With the highest standards and best quality Cornish produce we really do provide the tastiest hog roasts in Cornwall. We are well known for being the best Hog Roast Caters in Cornwall, and with good reason, we strive to provide fantastic tasting food partnered with an unbeatable service to make your party unforgetable. 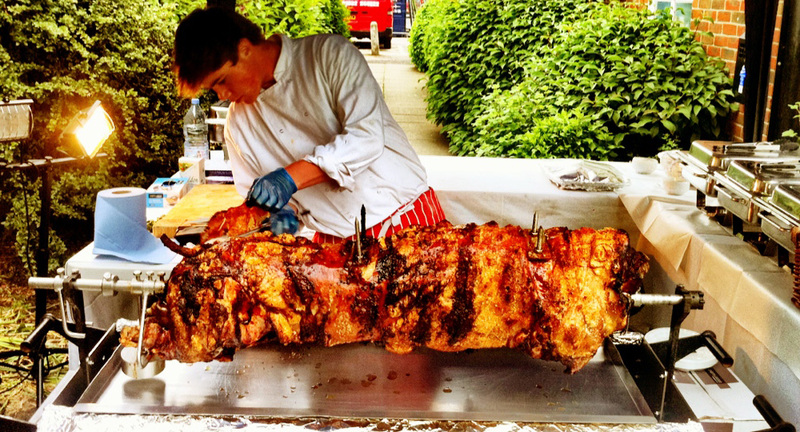 Every event is just as special as the other, we never get bored of hog roasting, just as you will never get bored of tucking into a delicious hog roast. I live and work from my farm based in Foxhole in the beautiful and picturesque Cornish countryside. From here we provide our hog roast catering service and it is the perfect base with readily available fresh salad ingredients and vegetables right here on the farm. We believe massively in home-grown or locallay reared products as we think it makes them extra special and it is clear that the Cornish public agree. I am so lucky and privileged to be able to live in one of the most beautiful parts of Britain and can get no greater pleasure in working in the outdoors and watching the landscape change and the seasons develop. The farm where we live has been in my family for generations and that is not something that I would ever want to change. Where possible we grow our own fruit and vegetables, provide our own homemade pies and sauces, so that we know we are using the freshest and best quality products and ingredients. Over the last few years and our increased success with the Spitting Pig, I knew we needed somewhere to store our fresh products and ingredients as the busy summer months were coming up and our bookings were increasing. I opted to have a specially designed depot built that is perfect for storing large quantities of food. 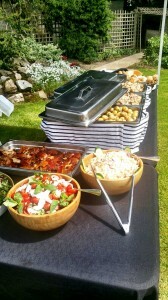 The Hog Roast Cornwall catering that we provide is famed for the amazing food and service. We take no short cuts when catering; everything that you’re getting is of only the highest standards. The staff we employ are fully trained professionals with education and real experience in their role, whether office workers, chefs or waiters and waitresses. Without a real advertising and marketing business we depend largely on word of mouth promotion, the excellence that we guarantee and constantly deliver is the main reason for our unrelenting growth and popularity – We wouldn’t be where we are today, as Cornwall’s favourite caterers, without it. It’s not often people get to enjoy a Bodmin hog roast and that makes it one of the main selling points, the level of uniqueness afforded by a Falmouth hog roast will benefit you greatly. If you’re selling food at a fundraising event or at a sports game you give yourself quite a bit of distinction and that translates directly into profits or funds raised. People love sampling something new, unusual and out of the ordinary. It’s somewhat of a novelty, in a good sense of course. A whole pig being roasted on a spit roast machine stands out, catching people’s attention and promoting an increase of sales. You’re setting yourself apart from the rest and putting yourself in a position to reap the benefits. When looking at catering options, price is always a huge factor and more often than not a deal maker or breaker for many people, there’s also many people out there who simply don’t care much for the fancy and elaborate, more expensive food – We know this and created our pig roast sandwich menu option so that you can enjoy our award winning catering at a price that’s affordable for you. Need to feed a large number of people without getting yourself in debt in the process? The wonder hog roasted pig sandwiches we cook up are a real crowd pleaser and great for corporate business meetings, fund raising events and pre and post sports game breakfast and lunch. I’ve always been driven by a desire to spread the gospel of a Padstow hog roast and our pig sandwich option is a great way to do so. People frequently ask me why I continue with the cheaper menu options, despite the fact we have an extremely healthy demand for our more up market menus, so why not focus our attentions there and ditch our pig roast sandwiches. It’s a fair question but flawed in that it overlooks the most important thing about me and my c ompany – We love hog roasting! My love for spit roasting almost borders on the religious and fanatical, I would be failing hog roasting if I strayed away from the simple delights of hog roasting in the pursuit of a little more financial profit. Truth be told my business is successful enough and I make enough money as it is, with that in mind denying the average man a decent hog roast, for a few extra quid each week borders on the blasphemous. Spitting Pig certainly doesn’t start and end with catering though, we can also hire out our machines without food, chefs and waiting staff. It’s the cheaper of the two options but the nature of hog roasting makes it equally tasty and impressive. The chefs we employ are fantastic and know the ins and out of hog roasting but at its core hog roasting is really rather straight forward, with the machine hire service you can cook and serve the wonderful spit roasted foods yourself. When we deliver the machine to you (free of charge) with your bottle of gas (also free of charge) one of our trained members of staff will show you how to operate the machine. It’s not very complicated and we won’t take much of your time! And because the machine does most the hard work for you the quality between what you cook and what we cook isn’t all that great. Although we’d advise making sure you find a good pig, we can sell you one or point you in the right direction with that. If that isn’t enough and you want something more we have several hog roast menu options for you. With your meat sandwiches of choice we can also provide you freshly prepared salads and new potatoes with our special herb butter. We can also provide our tasty canapés and desserts if your event is a longer one and you would like more food. With all options you’ll also be provided with a serving table and napkins, as well as your very own Hog Roast chef to prepare, cook and carve the meat of your choice. 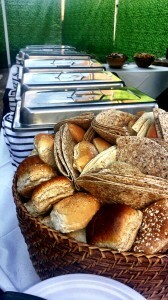 From a business standpoint using the Hog Roast Cornwall catering service can be a real game winner. In the business world image is everything and it’s extremely important to paint a decent picture of the values and standing of you and your business. With our high quality hog roast catering you’ll definitely impress as it’s often the small things that matter and the difference between a few homemade tuna sandwiches and what we offer could be what makes or breaks a potential relationship with clients. After all we have achieved I never forget to look back from where it all started, I met my wife 20 years ago, we had similar friends that introduced us and it wasn’t before long that we were engaged to be married. Julie has always been a fantastic cook and trained as a chef working a restaurant in Falmouth, so what a team we made! We were always the entrepreneurial types and constantly looked at ways to expand the family business, the Spitting Pig company was a fantastic opportunity for us to do just that! It was one Christmas where we decided to go to a hog roast to accompany our trailer on the market to we hired a hog roast machine off a local farmer you used it for parities. It was an instant success and we could believe how easy it was. This then became a monthly addition at the market and we could see its potential as people would ask us if we did private event. Seeing a gap in the market we contacted the company who made the machines, which was the Spitting Pig and we enquired about one of our own. After a hugely successful summer went were taken under the wing of the Spitting Pig and haven’t looked back since. We are now in our 4th year under the Spitting Pig and have enjoyed considerable success.